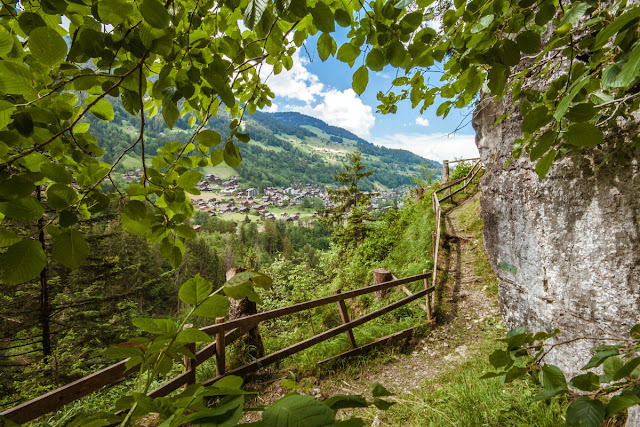 This is a 5.5 km (3.44 Mile) round trip hike starting from the Champery Cable Car station. It climbs uphill about 250 meters to the Les Rives restaurant and then starts to descend again back to the cable car station in Champery. It took us about 2.5 hours to complete at a leisurely pace with Lucas (3 years old), Eliana (6 years old), myself (6 months pregnant), Jonathan and my Mom. The trail, which is carved partially into a sheer rock wall, is not for the faint of heart. 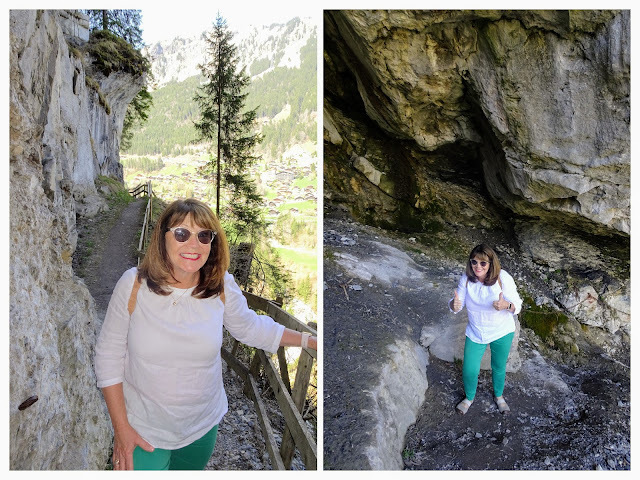 I doubt that my Mom, who has a fear of heights, would look forward to doing this hike again. The rest of us however really enjoyed the views and the journey. However, we did make sure that young hands were held tightly and on the inside of the path against the wall (away from the fence). 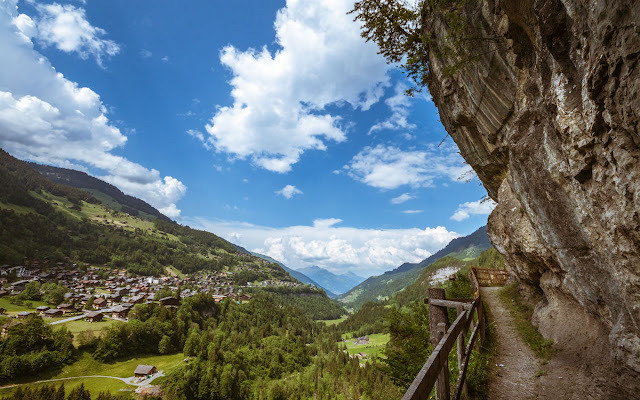 There are a couple small waterfalls on the hike up and some mossy rocks to climb, but the majority of the hike looks over the town of Champery as you follow the path along the rock wall. Once at the top, you are greeted with beautiful views of the mountains and the Les Rives Restaurant. To climb back down, you can either return the same way you had come up or you can walk down the road that leads to the restaurant. We opted to walk along the quiet country road for different scenery. Walk down the hill on Route des Rives away from the restaurant, past some alpine farms, until you reach Chemin des Journelles. Turn right onto Chemin des Journelles (here), and continue walking on a more shady wooded path. This path will lead you back toward the start of the hike. You will pass by the turn for Accrobranche du Dahu. Do not turn toward the Accrobranche. Instead, continue straight downhill as you will meet up with the original trail that leads back to the cable car station which is on Route de la Fin. For trail details click here. For Champery's website about this trail click here. 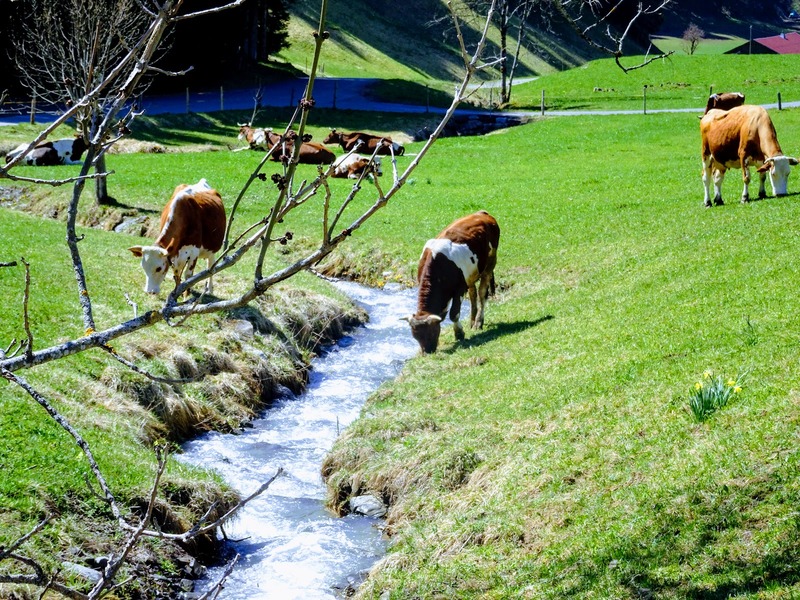 For full photo album of our Galeries Defago hike in Champery click Here. We happened to hike this trail in the 2 weeks that the Les Rives Restaurant closes for the year. 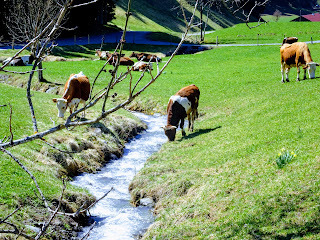 We will have to go again and try the restaurant, but if you find the restaurant closed then we can recommend another restaurant in the town of Champery that we have eaten at twice. It is Alta 1874 and we have been very satisfied with our food and service both times and would highly recommend it. For photos of our Winter day trip to Champery click here.